George Blytas' bookprovides a sweeping account of the role that Greece played in the Second World War. During the first thirteen months of the war, Hitler's unstoppable war machine had occupied seven European countries and had enslaved a population of 120 million by fighting for less than three months. The surprising seven-month-long Greek resistance to the invading armies of Italy and Germany that followed in 1940-1941, gave the Greeks the first Allied victories on land, and became a beacon of hope and an inspiration to freedom-loving countries everywhere. The Greek victories provided badly needed relief to the British who, at that time, were fighting the Axis alone. These archives of the warring armies provide the backdrop of ferocious battles of the Greek forces against the numerically superior and far better equipped Italian and German troops. Personal accounts by men and women who lived through extraordinary events provide the details, pinpointing moments that both horrify and inspire. From the introduction, which describes the events leading to the Second World War, the book unfolds through the diplomatic and military developments of the battle of Greece. The resistance, which emerged during the occupation and persisted through to the liberation at a staggering cost to the Greek nation, completes the saga. The book explains how the tenacity of the Greeks forced Hitler to disperse his forces in a manner unfavorable to his strategic objectives. It catalyzed the alliance between Britain and the United States, and resulted in aborting the Axis plans in the Mediterranean, the Middle East, and the Eastern Front. "...he has brought to this narrative a breadth, a depth, and a balance that is so often missing..." - from the Foreword by Robin Higham, Professor Emeritus of Military History, Kansas State University and Author, Diary of a Disaster, British Aid to Greece, 1940-1941 (1986). "Each year, new books appear in bookstores which chronicle the exploits of men, units, or governments during World War II. Seldom do authors take on the immense task of telling the story of an entire nation's efforts to defend their territorial integrity, national sovereignty, and democratic principles against the neighboring Axis. 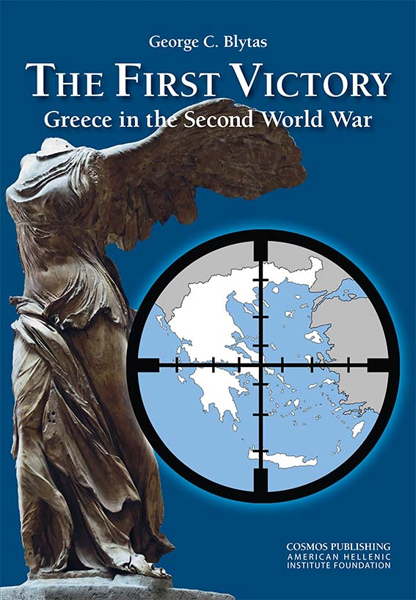 George Blytas has written a passionate tale in First Victory, providing the reader with new insights into the ideological, logistical, and military aspects of Greece's efforts to remain independent of the assault from Italy and Germany during WWII. "George Blytas has produced an extremely valuable and unique, overarching account of Greece's involvement in the Second World War. It offers a most readable blend of military and political history based on a wide range of secondary sources as well as personal accounts of survivors from that period. His work highlights Greece's remarkable performance in confronting the Axis forces both during the country's involvement in the world war, when it heroically repulsed Italy's attack before succumbing to the Germans, and its subsequent resistance movement against the occupying forces. George Blytas combines an eye for detail in discussing a particular battle with an awareness of the broader domestic and international context and manages to compose a consistently engaging narrative. It is an evocative yet dispassionately written account that should appeal to readers interested not only in modern Greek history but also in the history of the Second World War in Europe and the Mediterranean. "George Blytas's book brings Greece's heroic and pivotal role in WWII to the forefront. Few people realize that Greece's defeat of Mussolini's forces in 1940 was "The First Victory" against Axis forces in World War II and forced Hitler to invade Greece and delay his Operation Barbarossa against the Soviet Union, a key factor in Hitler's failure to defeat the Soviet Union."